Whether it is building your professional networks to having a full functional work desk, HSR shows us how it is done as we highlight these top co-workspaces to check out. From Uber to the solo-entrepreneur and everyone in between, we are all abuzz for the Bhive brand and with good reason. Posh interiors with funky wall-doodles, spacious desk spaces, conference rooms and an energetic atmosphere are one the many reasons, why this work space stands out. But what puts the Bhive in the spotlight is the growing community that it creates. 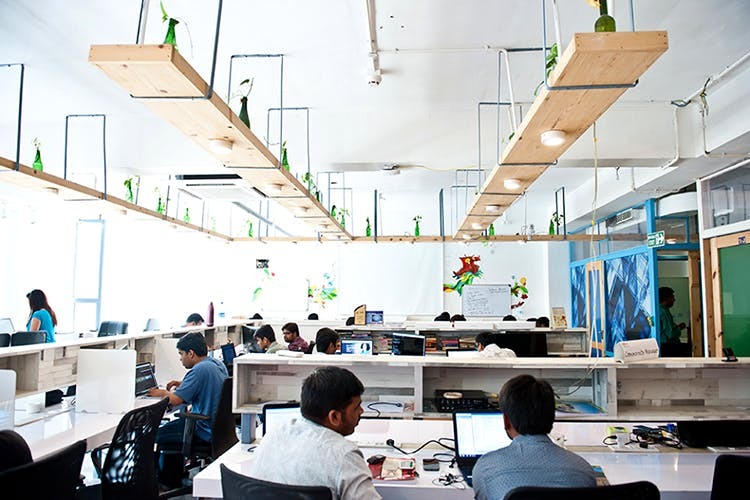 If you are looking to build your dream team, Bhive Workspace has a list of events that will get you immersed in connecting with entrepreneurs and start-ups from various streams. Team LBB worked out of here a couple of time, and it’s great to connect with fellow dreamers. For those seeking guidance, attend their talks and seminars led by industry influencers. If your dream team is ready to rock and roll, CoWork Cafe offers the support to run your venture. Sometimes it is the little things that can go a long way, like access to renting laptops or dongles, or make use of their locker room facilities so you don’t have to carry your work home. CoWork Cafe also helps start-ups with business incubation by provided added assistance when it comes to HR, marketing, operations, accounting and more. If your start-up caters to international clients, night shifts are not a problem as CoWork is open 24 hours keeping in mind UK and US work timings. If you are the ringmaster of your venture, and just require the basics without splurging then, 365 Shared Space is for you. Running affordable plans with desk spaces, that come with top-notch WiFi and other office essentials like access to printing and conference rooms. A bonus is freebies from the company partners, and discounted or free entry to events, which is applicable to all plans be it daily or monthly. If you have a growing team and the budget to invest, Workshaala offers offices with sleek and modern interiors that give it the corporate feel. Minus the traditional setup of deposits, set-up costs and lease hassles – rent floors or sections that are as ready to go as your team. The floor plans come with individual manager cabins, cubicles and private team rooms that are perfect for brainstorming, meetings and conference calls. Green Bubbles offers all the essentials that one can expect from a workspace – meeting rooms, desk spaces and office supplies. The one factor that sets Green Bubbles apart is that it is catered to start-ups that centre around workshops. The space offers a conference room that can seat upto 50 people. Whether your start-up caters to classes, training sessions or hosting workshops – Green Bubbles sets the space with the basic add-ons like whiteboards, projectors and tea or coffee.